The Life of Bon: Helping your toddler eat healthy food: HELP! Well folks it happened in the blink of an eye. June is a full blown toddler now. She runs around, says indecipherable words, and has melt downs when she doesn't get diet coke. It's cute! And I miss my little baby only a little bit. June used to be the best eater. She downed vegetables, rice, fruit, oatmeal, basically everything that was healthy. It was awesome! And I felt like a five star mom. None of this weird mom guilt because my baby wasn't eating healthy food. I had raised my baby to be a true champion. A true healthy eating champion! Well, the older June has gotten the less well she eats. It started when she figured out what was in a diet coke can... diet coke of course! It all went down hill very quickly after that. Earlier this week I heard a rustling in the pantry. June was in the crock pot with a ONE POUND bag of chocolate chips. 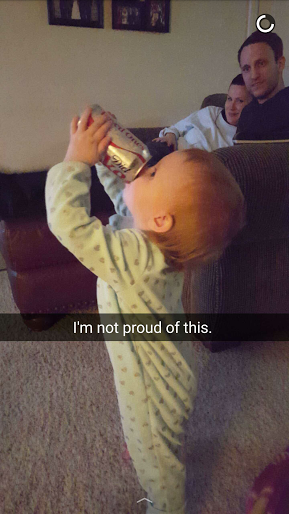 Not my finest parenting moment. We did find one thing this week that is helping us in the healthy and easy snacks department. Has anyone tried these bad boys? We love that they mix so many different healthy food groups- oatmeal + yogurt + fruit. June usually eats it as a snack after her nap, but I love that it is healthy enough that I could throw a half a banana in the mix and call it good for breakfast. Oh, and if you do decide to try out our new favorite snack, click here for a $.35 off coupon. If you're buying several, (and you will want to!) the savings add up fast!